Lion Air and Ethiopian Airlines experienced crashes involving Boeing's 737 MAX 8 model aircraft in October 2018 and March 2019, respectively. The MAX models are now grounded. There already is, will be, and should be financial consequences resulting from these two tragedies. The debate will be which party should rightly bear such consequences. Albeit unknowingly, Air Lease has provided a safer alternative that should prove immune to cash flow disruptions and subsequent share price fluctuations resulting from the consequences of the grounding. When tragedy strikes, analysts and experts often scramble to determine the financial impact - who could lose and who may profit. This hardly suggests tragic losses can simply be priced. Rather, I would propose they are compartmentalizing the financial consequences separately from the personal tragedy. On October 29, 2018, Lion Air flight JT610 departed Jakarta, Indonesia headed for Pangkal Pinang and lost contact 13 minutes later. On March 10, 2019, Ethiopian Airlines flight 302 departed Addis Ababa for Nairobi, Kenya and crashed six minutes after take-off. Both flights employed Boeing's (BA) 737 MAX 8 aircraft. On March 13, 2019, the United States' FAA (Federal Aviation Administration) grounded the 737 MAX 8 and 737 MAX 9 aircraft - by both prohibiting U.S. operators from operating the planes and prohibiting the operation of the planes in U.S. territory. Boeing only started delivering the 737 MAX aircraft in 2017. Though there are approximately 4,600 on back order, less than 400 have been delivered and are, subsequently, now grounded. In a formal statement posted to its website on April 4th, Boeing CEO Dennis Muilenburg acknowledged the company's responsibility. As pilots have told us, erroneous activation of the MCAS function can add to what is already a high workload environment. It's our responsibility to eliminate this risk. We own it and we know how to do it. This update (a software update that will ensure accidents like that of Lion Air Flight 610 and Ethiopian Airlines Flight 302 never happen again), along with the associated training and additional educational materials that pilots want in the wake of these accidents, will eliminate the possibility of unintended MCAS activation and prevent an MCAS-related accident from ever happening again." It is not up for debate whether the loss of lives resulting from these two crashes was tragic. Three hundred and forty-six individuals were lost and it is tragic. Period. Ultimately, aviation authorities and investigators will determine the exact failures and assign fault. The families of the lost passengers and crew deserve to have these answers. Future passengers deserve to believe any and all risks that can be lessened and have been eliminated. There already is, will be, and should be financial consequences resulting from these two tragedies. A discussion about how to navigate this impact is certainly not meant to disrespect the loss of life. So, it is with the utmost respect and empathy for those who lost loved ones that such a discussion follows. Grounding, temporary or permanent, creates a ripple effect for the airlines, through the airports, to the passengers and, eventually, shareholders. But, airlines are not the only owners of Boeing's 737 MAX models. Aircraft lessors, including Air Lease Corporation (AL), also own dozens of these aircraft. In its annual reports, Air Lease, an aircraft lessor with a global customer base, explains it does have a base level of protection when groundings occur. The lessee generally is required to continue to make lease payments under all circumstances, including periods during which the aircraft is not in operation due to maintenance or grounding." The aviation industry needs more and newer aircraft. 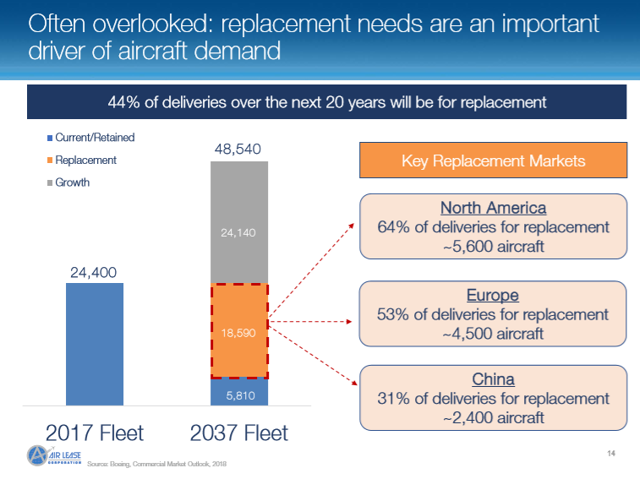 By 2037, it's expected $6.3 trillion will be invested in nearly 43,000 additional aircraft. Demand is being driven by steady increases in passenger traffic and the ongoing need to replace aging aircraft. 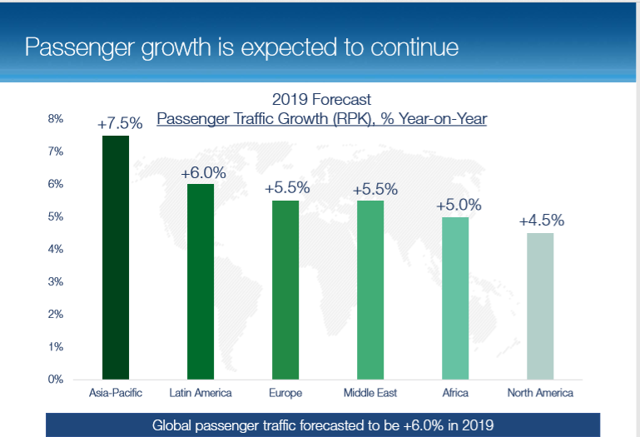 The emergence of low-cost carriers and the global expansion of the middle class is driving the uptrend in passenger traffic. By 2025, over 20% of the industry's current fleet will be over 20 years old. An analysis in an American Banker Asset Securitization Report (NYSE:ASR) explores the potential ripple effect of grounding a specific model for aircraft lessors. First, it must be acknowledged smaller airlines often rely on leasing. Indeed, Air Lease touts it has relationships with 200 airlines across 70 countries. In 2018, the lessor had active leases with 94 customers. No individual customer accounted for 10% of its revenue. The financial burden falls almost exclusively on the airlines, so much so that some weaker airlines could eventually face financial difficulties because of liabilities to lessors." 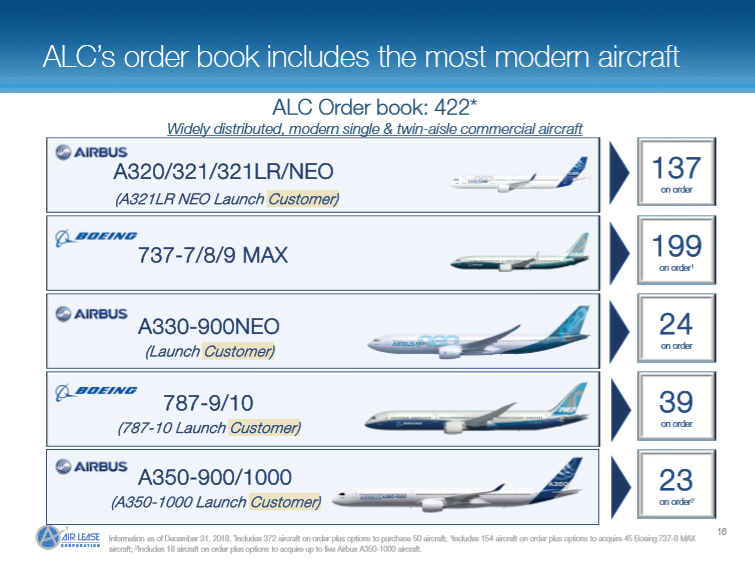 Air Lease details the potential impact in its annual report. Such events are likely to cause our lessees to incur higher costs and to generate lower revenues, which could result in a material adverse effect on their financial condition and liquidity, including their ability to make rental and other lease payments to us or to obtain the types and amounts of insurance we require. This in turn could lead to aircraft groundings or additional lease restructurings and repossessions, increase our cost of remarketing or selling aircraft, impair our ability to remarket or otherwise dispose of aircraft on favorable terms or at all, or reduce the proceeds we receive for our aircraft in a disposition." The American Banker ASR details some of the higher costs. According to the United Kingdom consultant, the International Bureau of Aviation, a monthly lease for a 737 MAX plane averages $360,000. When grounded, airlines must also incur costs for storage at major airports, salaries for idled crews, and compensation to impacted passengers. The IBA estimates these costs could near $150,000 per day. In a nutshell, cash flow is definitely significantly impacted by the grounding. Again, at this point, there is no debate about whether there should be financial consequences. Yet, until the root cause is determined, many will question if the consequences are being paid by the appropriate party. Before the grounding, in response to both actual and rumored airline failures, Air Lease did emphasize its placement strategy in its year-end earnings call in February 2019. ALC has prudent risk management practices in place. As with any placement, it is important to evaluate the circumstances. But, ultimately, we will support a quality, well-run and well-financed airline." The second ripple effect of grounding non-operational aircraft for lessors flows from managing its fleet replacement and growth. Air Lease has 154,737 MAX aircraft on order with options to acquire 45 more. Again, the associated risks are not unforeseen and are detailed in the company's annual report. technical or other difficulties with aircraft after delivery that subject such aircraft to operating restrictions or groundings, resulting in a decline in value and lease rates of such aircraft and impairing our ability to lease or dispose of such aircraft on favorable terms or at all." Actually and unfortunately, delivery delays have not been foreign for aircraft lessors including Air Lease. There have been recent well-publicized delays by airframe and engine manufacturers in meeting stated deadlines in bringing new aircraft to market. Over the past two years, we have experienced delays relating to certain aircraft scheduled for delivery in 2019 and 2020 and anticipate additional delivery delays." Despite the juggling scenario, before the grounding, Air Lease anticipated taking delivery of 80 aircraft in 2019. The vast majority, 91%, of its order book had been placed on long-term leases through 2020. In its annual reports, the company elucidates its leases contain cancellation clauses for delivery delays topping one year. As well, its purchase agreements allow the same type of cancellation. But, these safeguards do not necessarily safeguard the company from reputation damage. Any such termination could strain our relations with those lessees going forward and would negatively affect our cash flow and results of operations." That's not to say there is zero potential for upside from a grounding event. An ongoing grounding of the 737 MAX model most likely means viable airlines will be extending existing leases on other models. The American Banker ASR extrapolates the demise of smaller airlines could actually provide relief should the grounding persist. Growing numbers of smaller airlines are going under, releasing from their fleets dozens of narrowbody planes after bankruptcy or liquidation." Again, projected cash flows will almost definitely be disrupted by the juggling, the delays, and the possible influx of used aircraft. And, again, there is no debate about whether financial consequences should occur. The debate will be which party should rightly bear such consequences. It is easy to see how innocent parties may be wrongly impacted. Rightfully, the grounding of the 737 MAX models could concern existing shareholders in Air Lease. A falling share price, slower dividend growth, a frozen dividend rate, or even a dividend cut could be possible impacts. Yet, even before the 737 MAX models were grounded, Air Lease provided a viable alternative for investing that should prove immune to cash flow disruptions and subsequent share price fluctuations, albeit unknowingly. The company initially filed to offer preferred shares on November 20, 2018, months before the second crash and the grounding. The purpose of any offerings would be to fund general corporate operations and/or to repay indebtedness. On February 26, 2019, Air Lease filed the prospectus to issue its first preferred stock. Ten million Series A shares were offered. It trades on the NYSE under the ticker AL PRA (AL.PA). They may be redeemed for $25 per share (the call price) on or after March 15, 2024 (the call date). The stock was issued without a maturity date - meaning it is perpetual. Up to March 15, 2024, the shares offer a 6.15% fixed dividend yield, an annual rate of $1.5375 per share. After that point, the yield will adjust to a floating rate "equal to three-month LIBOR plus a spread of 3.650% per annum, reset quarterly, payable quarterly in arrears". The dividend is non-cumulative which means if a payment is skipped, it does not accumulate for payment later. But, preferred stock dividend payments must take precedence over common stock dividend payments and common stock repurchases. As Air Lease navigates these latest challenges in the industry, the share price on its common stock could very easily react and react negatively. Comparatively, preferred shares offer stability because they will typically trade in a fairly tight range based on the call price. To its credit, Air Lease has aggressively grown its common stock dividend the past six years from $0.10 annually to $0.52 annually. Still, the dividend yield on the common falls below 1.5% when the share price is above $34.67. Considering the potential for cash flow disruption resulting from the grounding, it may not be reasonable to expect Air Lease to continue to grow the common stock dividend rate at such an aggressive clip. Of course, the dividend rate on the preferred won't change for five years. Still, the preferred yield is more than 4X that of the common stock. There are financial consequences to tragedy. But, this, most certainly, does not mean tragedy can simply be priced. Some may debate ad nauseam whether investors should profit from tragedy. Yet, most would probably agree it is reasonable to seek safer alternatives when a company they are invested in may suffer financial consequences resulting from a tragedy. The Lion Air and Ethiopian Airlines crashes were tragedies. The grounding of the 737 MAX models, though necessary, already has and will continue to have financial consequences. Air Lease could easily be impacted by such consequences. Those interested in or invested in Air Lease may want to consider the company's new preferred shares as a safer alternative. Disclosure: I am/we are long AL, BA. I wrote this article myself, and it expresses my own opinions. I am not receiving compensation for it (other than from Seeking Alpha). I have no business relationship with any company whose stock is mentioned in this article. Additional disclosure: I belong to an investment club that owns shares in BA. I am recommending an investment in AL.PA at April's meeting.